A high cadence is part of good running form. Most pros take upwards of 180 steps per minute, and that's a pretty good goal to aim for. 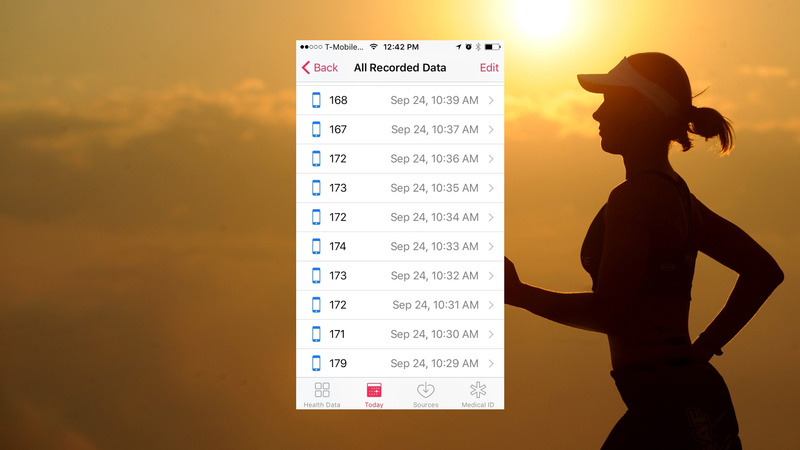 But you don't have to count your steps the old fashioned way; your iPhone is already keeping track for you. To see your step counts, go to the Health app, tap on a recent step count, and then tap "Show All Data." You'll see a day-by-day, and then minute-by-minute, breakdown of the steps you've taken. Scroll down to a time you know you were out for a run, and see what the counts look like. For example, one of my recent runs starts with 139 steps (I must have started partway through the minute) followed by a half hour's worth of entries in the neighbourhood of 170. Any time I stopped for a drink, the step count went down again, but there are still plenty of counts for minutes that I know I was running. Don't get discouraged if the number varies from minute to minute; it's normal to adjust your cadence as you change speed and terrain. But scrolling down the list can give you a sense of what kind of cadence you gravitate toward, and how consistent it is.